Tuna fishing in any water can be quite an experience, but fishing for them near Venice LA is a once in a lifetime experience. The Yellowfin in this part of the Gulf of Mexico can reach record sizes, providing visitors that thrill that will last forever. Your local charter boat fishing captain uses decades of experience to get you to where these fish are in abundance, and has a few secrets up their sleeves for finding those monsters. Here are some tips and tricks for tuna fishing near the mouth of the Mississippi River in Louisiana that will help you land a monster tuna. 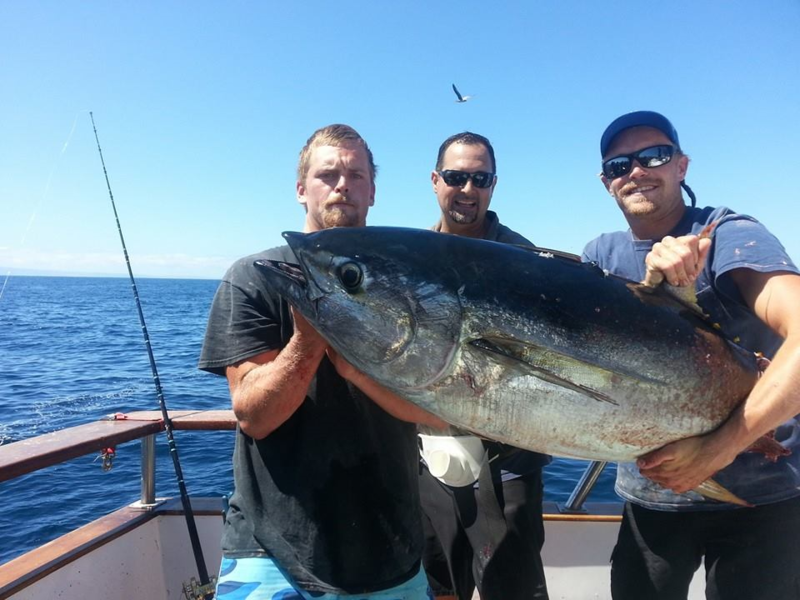 One of the best kept secrets in the south is fishing for the monster tuna near oils rigs. There are numerous oil rigs dotting the horizon on the Gulf, and local fishermen have been spoiled for years bringing their fishing boats as close as possible to haul in monster tuna. Now it isn’t just about cruising the rigs to find tuna, it also works in conjunction with the right bait fish, time of year, and the water conditions. As you arrive near the rigs, pay close attention to the surface waters. The Yellowfin tuna love to hang around the up-current on the sides of the rigs. Check the waters around the rig for sub-currents too. The larger of the tuna will move around in different currents, despite what it showing on the surface. The rig is not as important as the water depth. The deeper the water you are fishing, the bigger the tuna you are catching. The optimal depth to catch tuna near the basin of the Mississippi River is 1,500 feet and more. It is very important that you are paying close attention to your depth sounder, marking locations beneath the boat to make sure that your lures are down at the correct depth. The reason being is that the larger tuna are less afraid down that deep, and more likely to take a stab at your bait if you can find them.Make certain that you get a good feel for the weight of the tuna on your line. If you don’t and set the hook, it is going to be gone in the blink of an eye. One of the more productive ways to attract the tuna near the boat is to chum the waters. Not only will the tuna come closer to the surface, they will arrive in record numbers too. Once they reach the chum, the action could be fierce as they fight each other for a free meal. One of the tricks for attracting the big tuna after chumming the water is to turn off the boat engine or generator, and allow the vessel to just drift along. Without the sound, the tuna will get amazingly close to the boat.One tip to consider when chumming the deeper waters is that your actions could also attract sharks. Sharks are not good for fishing, so just start the boat and move on to another spot once the sharks arrive. Trying to catch the tuna near the surface can be extremely frustrating because the big fish will quickly dive to deeper waters as the boat approaches. The trick to faking out the tuna is trolling slowly, somewhere around three knots while running a line on a high angle so the bait floats 300 yards behind your boat. The reason that this trick works is because the tuna will not associate the bait and the boat that far apart, so you can move in for the taking.When it comes to fishing for tuna in the Gulf near the basin of the Mississippi, the best time to move in is fall and winter. The cleaner water is pushing towards the shore, discharging volume from the Mississippi. One tip for locating the tuna is to simply follow where the shrimp boats are trolling. The team on the shrimp boats will chum the water, which attracts schools of tuna to the surface. As the shrimp boats move about, you can get lucky and hook up with the tuna who are in a feeding frenzy and wander away from the chum trail. The waters of the Gulf near 20 miles out or more are ideal for catching the bigger tuna. When you are out with a charter boat, the captain usually has an idea which shrimp boats have been out a few days.The tuna get used to the patterns of those shrimp boats and can make for easy fishing. If you can get out on the water before dawn, you can intercept the shrimpers and be there when the chumming starts. Catching tuna in the basin of the Mississippi takes patience, so let the charter boat fishing Louisiana captain get you near the fish, while you and your group scan the waters for signs of the tuna. There should be someone near the helm all the time, while some toss chum into the waters. If nothing else, you have to be patient. Although the tuna are in abundance in the area, they tend to hide very well and come out under ideal conditions.It might be seven hours of hard work on the water before you see your first bite, but it will be worth the wait. If you’re visiting the area and want to land your own monster tuna, book a day trip with the local charter boat fishing Louisiana captain. Fishing for those tuna in this part of the south is not just a hobby, it is a way of life for locals. End the perfect fishing day by catching your very own tuna that might just get you in the local Louisiana record books. ← Where are the BIG Fish in Louisiana? Where are the BIG Fish in Louisiana? Copyright © 2019 Venice Fishing. Powered by WordPress. Theme: Accelerate by ThemeGrill.